Jobs for Englewood Parents!!! RSVP Today!! | R.A.G.E. 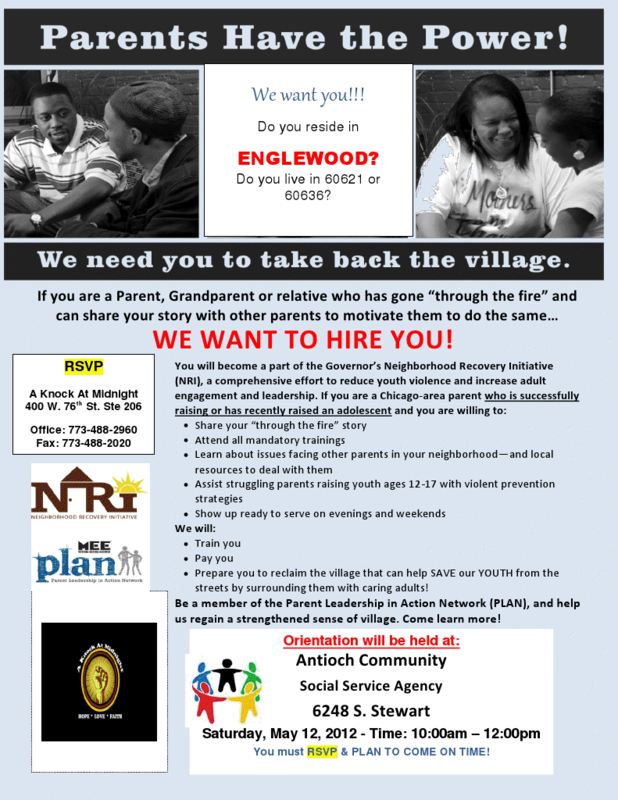 Jobs for Englewood Parents!!! RSVP Today!! The Englewood Neighborhood Recovery Initiative is excited to announce its Parent Leadership Action Network(PLAN) is returning to Englewood for a 2nd year!! An orientation will take place this Saturday, May 12th @ Antioch from 10a-12p. In order to be considered for employment, you must attend an orientation. If you are or know of parents who RESIDE inEnglewood, please have them RSVP, the contact information on the attached flyer. RSVP at A Knock At Midnight, 400 W. 76th St. Ste 206, Office: 773-488-2960, Fax: 773-488-2020. R.A.G.E. Bi-Monthly Village Meeting – May 15th – 6pm!